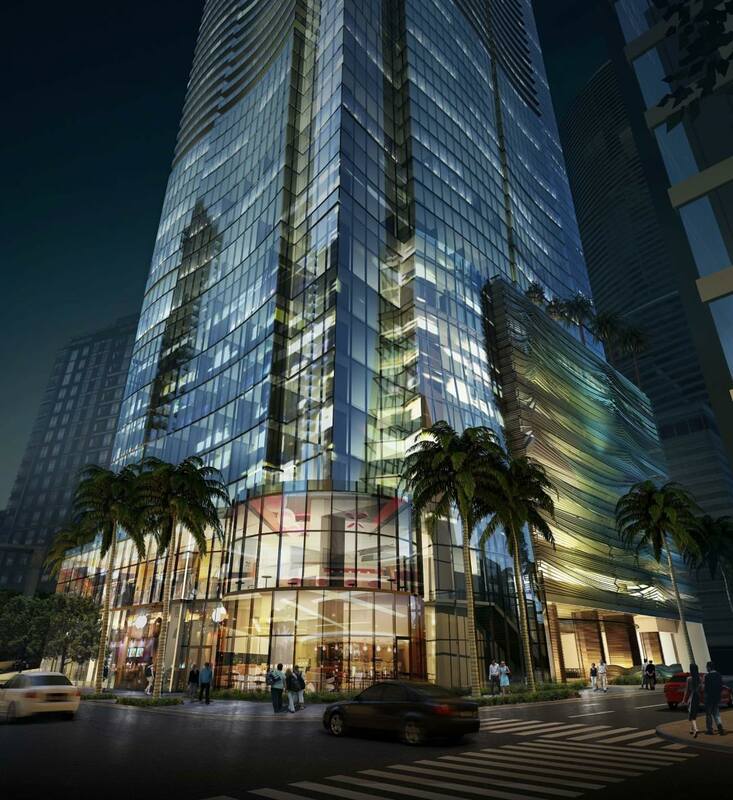 An 82-story tower known as 2nd & 2nd was granted approval last week when Miami’s Office of Zoning granted waivers needed from the Miami 21 zoning code. A notice issued on the city’s website confirmed the approval was issued November 26. Plans for the tower were first submitted in July 2017, making it 16 months of review. 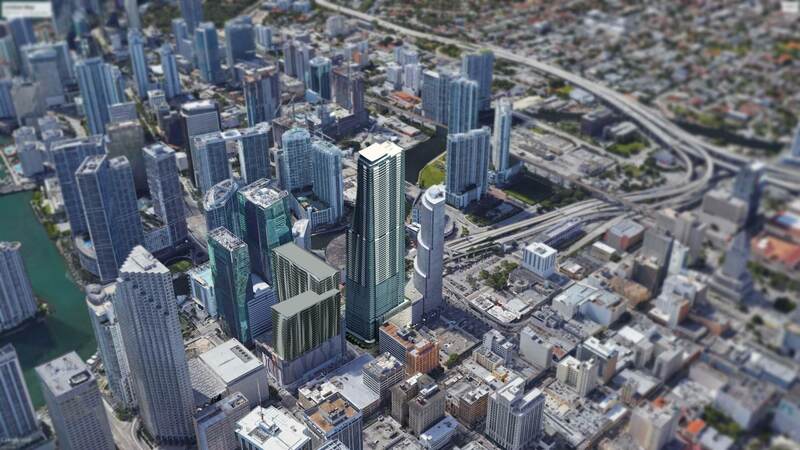 If construction were to begin today, it would become the tallest building in Miami at its proposed 898-foot height. 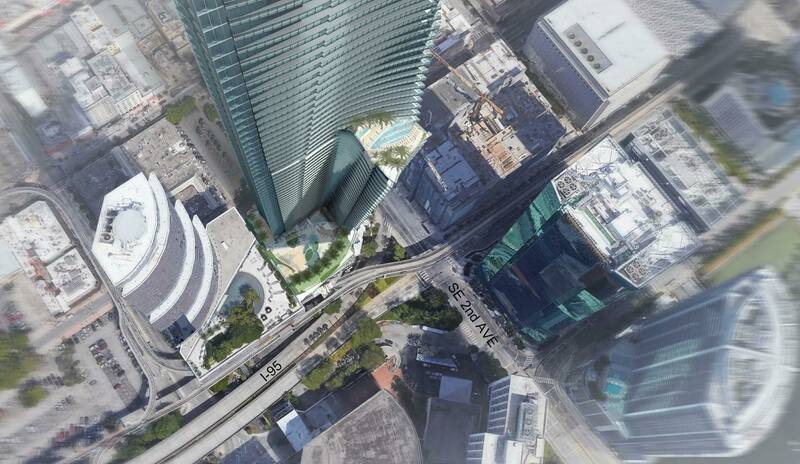 Brickell’s Panorama Tower is now the tallest at 868 feet, although several buildings are proposed above the 1,000-foot mark including Skyrise, where excavation is underway. A Courtyard by Marriott hotel would need to be demolished to make way for the new 2nd & 2nd tower. Convention Center Hotel Corp. of Yonkers, NY submitted the plans. The developer is a subsidiary of AVR Realty. Beautiful tower. Very city like. I even like the name. You are correct but trust me no one who lives near this will be laughing. We need a tunnel plain and simple. I wish the city would make it happen like they did for the Port of Miami. The traffic is horrible now but with thousand of more units being built it will truly be chaos! Which will be completed first: the construction at this intersection or the construction of the tower? My money’s on the tower. Um.. too close to call…. lol. But seriously, why does it take so long for small street construction projects here? I think it took over 6 months for them to complete the project on S Biscayne Blvd where they close 2 lanes of traffic. Most days, I would go out for lunch, and I would see no one working. Why is that? In cities like Japan they’ll do projects bigger than this overnight! Is it because of unions? Its because FDOT is an incompetent piece of crap! Union workers! One holds the flag, and six watch to ensure the sway of the flag is correct for the incoming traffic. 16 months of review.. Heck, Melo could build two towers in less time than that! More like three, their most recent tower in the Omni already has one tower topped off. Uff, no you didnt! !..You cant compare this Tower to a Melo tower…really! Boy, you really ain’t much when it comes to reading, are you? Melo..? They are a disaster and their finish of poor quality, clear example the Aria. I’m in love with this one! The Miami Tower that is famous for its lights looks so small now. Great project but will never be built or if it is it’s going to be flipped and redeveloped by someone else 3 cycles from now… too many units coming into play that have been approved for some time. We need more affordable units that aren’t broom closets and more 50K jobs in the downtown core. But 3 problems stand in the way 1. Local Politicians 2. Too low wages 3. Better public transportation … but I keep dreaming like the rest of 305! I might agree, but this location right in the middle of the CBD commands high prices. Affordable units should be built along Metrorail stops in underutilized areas. I bet you’re one of the people who said the same thing about the Aston Martin building. Please let this be real!!! I look at the site everyday an we all guess on which projects will be a flip. I normally believe most will be built but for some reason I think this will be a flip. I really hope not but my gut tells me flip ugh! love the tower….traffic in that area is brutal! finally a real downtown building. If the developer intends to build, I’ll help for free demoing the existing building. 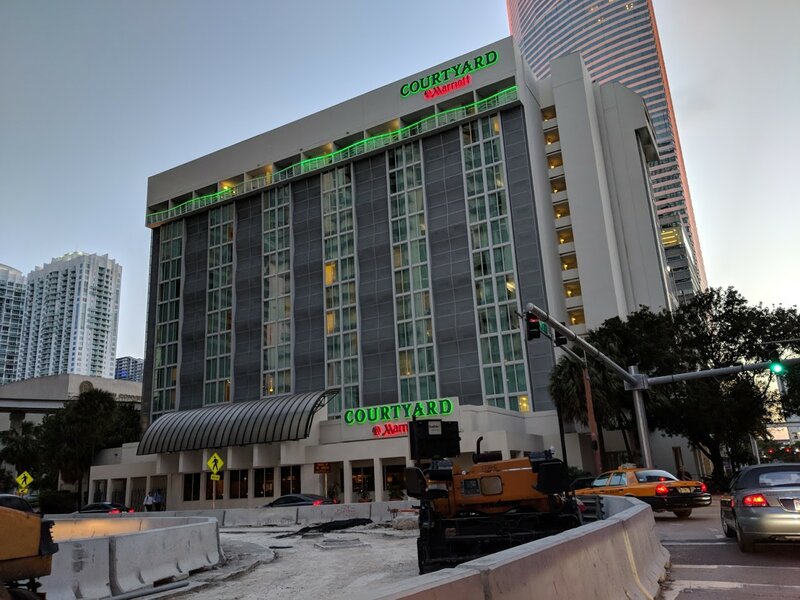 As much as Miami progresses and continues to attract jobs, it appears developers still believe the primary owners of these units will be out of towners, whether foreigners or snow birds. I don’t have official numbers, but it seems like most new proposed residential projects downtown and in Brickell are also incorporating a fair amount of hotel units as well. That to me signals these buildings aren’t meant for full-time residents. what a beauty!!! i really hope it gets built. Well, get over it! The escavation for the tower is underway. I like it it!! Except for that White Flat Roof slab at the top deck…Seems like the creative juices ran out at this level. Traffic wise, this is the worst intersection in downtown. City of Miami planners need to wake up! You people in Miami think anything is pretty if it’s covered in mirrors. What’s with ppl in miami always whining about parking parking? Come to DC and you will learn and adapt. Lack of parking forces ppl to use mass transit. Everytime i need to go to downtown DC for something i jump on the train/subway. Lack of parking and high priced parking will force ppl to adapt. Which train should we jump on? The one that goes to the Beach or the one to Wynwood or maybe out West.. In saying they need to build mass transit then ppl would adapt. I think it would be better if this Marriott hotel turned into a rental building instead of tearing it down. 2nd & 2nd is a beautiful skyscraper, but there are other ugly and useless buildings downtown that I wouldn’t mind seeing replaced by this architectural gem. There are a lot of people who would love to just have a room to rent and wouldn’t mind going downstairs or out somewhere to eat. 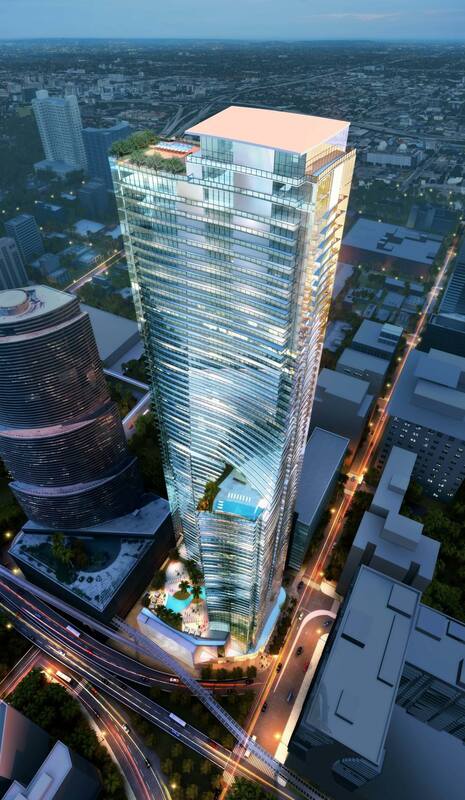 Panorama tower is 85 floors, making it taller than this project (approved for up to 82 floors). You may want to update. Would also be nice if they paid homage to the Courtyard Marriott in the architectural design. Office floors are taller than residential. Its about height, not stories. How many “Floors” will skyrise have a dozen, two dozen? Uhh.. reread that article, it says “If construction were to begin today, it (2nd & 2nd) would become the tallest building in Miami at its proposed 898-foot height. 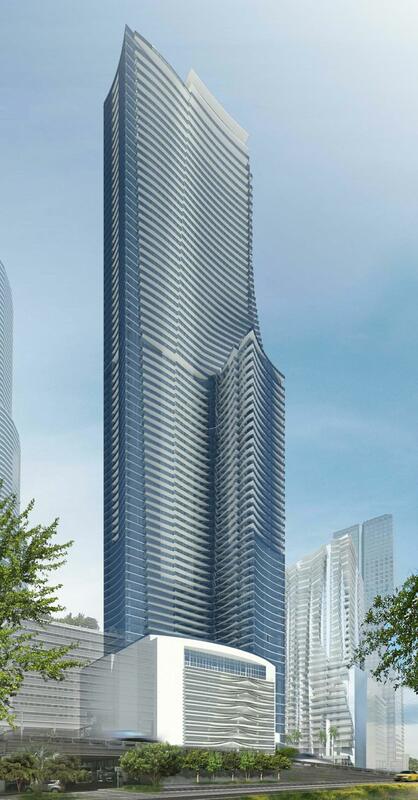 Brickell’s Panorama Tower is now the tallest at 868 feet. I guess you are one of the “most people” you are referring to. Your wife is 5ft 7ins tall and you are 6ft 2ins tall.. but it doesn’t matter because to most women she still holds the title of being taller than you. No, I am 1.88m and my girlfriend is 1.7m. I’m more in meaters and feet, obviously. Scale matters, just like -40 degrees Fahrenheit is the same as -40 degrees Celsius, but 100 degrees Fahrenheit is much colder than 100 degrees Celsius – you’d know this if your degree was worth more than the paper it’s written on – yes, I am talking about you Mr. FIU grad. What’s the difference between meaters and meters Mr. Hialeah Institute of Technology grad? Are you sure Mr Madson is not a Trump University grad? Look, I appreciate you trying to learn but my time is very valueable. If you want me to shove some knowledge into that cesspit of cretinism you call a brain, it’s going to cost you a pretty penny. Let me know if you’re interested and I’ll whip up a reading list for you to get started on. pay homage to the Courtyard Marriott in the architectural design…? what in the bath salts are you smoking??? Reading is fundamental, I suggest you take a class on comprehension. It’s a broken record but we’ll never become a great city if we keep building hundreds of additional parking spaces in our downtown. This is true but the fact that so many residential high rises have been built makes Miami’s urban core 1) unique and 2) 24/7 live work play. Agreed, however 75% are completely unaffordable to the average family unit. True. Average and below average people do not need to live in an above average neighborhood. We need more people that can function productively in an office environment – Not just a bunch seista-taking, ferragamo-moccasin-wearing dinguses that think a bluetooth headset and a leased porsche that’s half their paycheck makes them have some sort of business acumen. That being said, I appreciate them keeping my repo/tow truck business thriving even in this booming Trumpian Economy! Jealous much trumptard? The people you describe make 10 times what you make with your wannabe “business”. I can buy your 1996 Ford towing truck with pocket change and replace you with another red neck driver. Found the Ferragamo owner – and it looks like he didn’t get his siesta in today! I’ll have you know that any one of my 2018 Ford 650 car carriers costs more than the base model porsche 911 you can’t afford, look it up if you don’t believe me they’re over 100k. Truth hurts doesn’t it? Thanks for lining my pockets! “Booming Obama economy?” LOL, the old coach doesn’t get the credit for a football team’s successful season. The economy might have rebounded under Obama after the Republicans took Congress, but of course, low growth was the “new normal” and now Trump makes Obama eat those words. I tell you, if the economy tanks in a year, libtards will blame Trump as opposed to the psychos you placed in charged of the House, who would run the country into the ground if they could all because ORANGE MAN BAD delusions. Lol.. another Republikook that believes whatever Con-old Trump says. I remember, I think it was the debate between Trump and Hillary, the moderator asked Trump “you’re always saying how bad the economy is.. what plans or programs do you have to put in place to bring the economy out of this condition you say it’s in if you become president?” (or words to that effect). Con-old Trump said “I hire people to fix things.. that’s what I do.” Now tell me, O’wise and intelligent one.. name the people that Trump hired who magically turned an economy around that Con-old Trump call “a disaster” because all I see is Con-old Trump beating his chest and claiming what he did. Now if you don’t believe anything I said, just google it and find out for yourself. I want you to see the amount of Government spending that is going on right now. Then come back to me and tell me that the economy is roaring due to organic small business growth as Trump is currently touting like a mad man. Its because he is spending like a mad man. That is why growth is up so much. he has increased the deficit in 2 years as much as Obama increased it in 8. So PLEASE shut up and take your low growth BS to another forum! and here is your source if you give a crap. Cause i know those are the first words that will come out of your mouth. I’d tell you to look it up but I think your comment defines it better than Merrian Webster. Look no further! Awww Mr Madson, don’t be so coy! At least there are less parking spaces than residential units. Baby steps. Good, you got your “parking rocks” off.. now get back to your soap operas. Until mass transit is expanded there have to be garages. We can’t stop development to wait for gov mass transit lest we stagnate. At least this parking garage looks pretty. Even with good transit, some parking will still be needed for what this building commands.